We think we have been able to compose a highly varied Lucifer, with both scientific, philosophical and religious subjects. The article The Mathematics of Religion discusses the deepest essence of religion, but it also outlines how the most noble aspect of human consciousness can degenerate. Living in a world where religion often does much more harm than good, it is extremely useful to consider the content well. The degeneration process of religion often starts, because people believe that logical thinking and philosophy contradicts religion. In the article Does thinking exclude spirituality? an attempt is made to explain that spirituality and thinking are not in conflict with each other: something many people - including theosophists – often assume. In two articles we try to shine a light on meditation. What kind of meditation leads to expansion of consciousness and what kind does not? 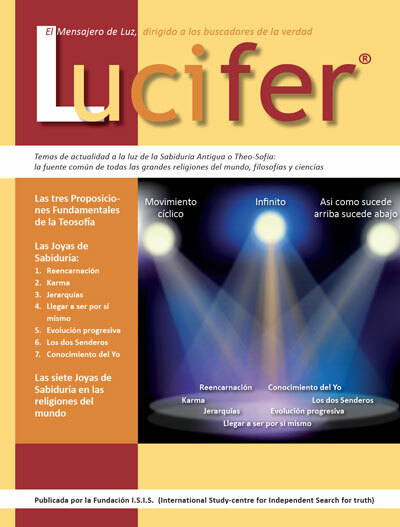 In this issue we publish part 1, in one of our next Lucifers part 2. We often get questions about the subjects illness and healing. We therefore think that many readers will appreciate the article The scientific approach of classical homeopathy. This article not only deals with homeopathy but also tries to answer the question what disease actually is. Finally, we answered a number of interesting questions, asked by a reader, about human and animal consciousness. We hope that this Lucifer may clarify some aspects of Theosophy, so that we are all able to better express The-osophy in our daily lives. As always, we are open to your comments, feedback and questions. In an article about the Mystery Schools, we travel back to the past when the Mystery Schools exercised a lofty influence on society. But we also look to the future. The question is asked whether the Theosophical Movement will assume the function of a Mystery School in the nearby future. In the article about nonviolence – Ahimsa – it is shown that you never have to accept injustice. You can always work actively and nonviolently for a just and harmonious society. The means however should always be as noble as the goal you are pursuing. The article about ADHD addresses the growing problem amongst today’s youth, that they are no longer able to concentrate. Or is this really a problem? In the article “Questions children ask” Gottfried de Purucker provides some valuable suggestions for answering intuitive questions from children. Finally, we have good news to announce, that the I.S.I.S. Foundation has recently posted the books by Katherine Tingley on the web. 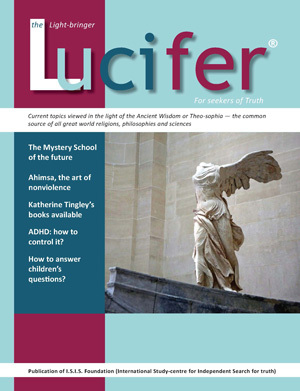 We hope that this issue of Lucifer, the Light-bringer will contribute to a better understanding and – most importantly – a better application of the theosophical teachings. We look forward to your questions and response. This first issue of the digital Lucifer the Light-bringer of the year 2017 has been realized for an important part due to the cooperation of different theosophical groups. One of the reasons we started in 2013 with the English Lucifer is to create a forum for exchanging ideas with Theosophists all over the world. If you look at the state of the world, it is clear that cooperation between all Theosophists is urgently needed. We have to work hard, unselfishly and cooperatively in order to give Theosophy its rightful place in the world. We have the idea that Lucifer can play a significant role in this work. Not only because our readership is expanding, but also because our readers may use the articles in this magazine as a source of inspiration for their promulgation work. At the International Theosophical Conference (I.T.C.) in Naarden, in 2014, the term cross-pollination was coined in theosophical fields. Theosophists can learn from each other. They can help each other. Visit the new ITC website to read this declaration. Two contributions in this Lucifer are lectures held at an Annual Convention of the Theosophical Society Adyar. The first is a lecture from 2016 by the vice-president of the TS Adyar. The thoughts in this lecture are so important that we gladly offer it to our readers. In 2017, for the second time a representative of the Theosophical Society Point Loma Blavatskyhouse gave a talk in Adyar. In this lecture the keys are given how to make unity a living power in your life, and in your theosophical work. 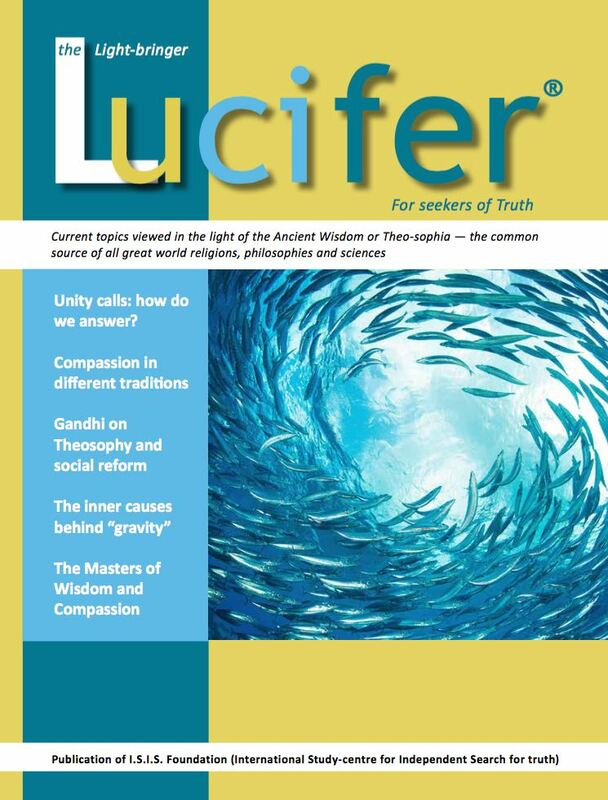 In this Lucifer you will also find a lecture on Gandhi by an associate of the United Lodge of Theosophists (ULT), which was held during the ITC 2016 in Santa Barbara. Theosophy was probably Gandhi’s fundamental source of inspiration. Finally, we have included a very interesting article about the causal factors behind gravity, a subject that evokes a lot scientific interest, but it certainly will not only be appreciated by scientists.